When I was a kid, it seemed that Christmas would never come. Maybe it had something to do with the fact that I started counting down till the big day at some point in October, but I would go crazy with anticipation for Christmas Eve. And I could never understand how my parents were so ambivalent toward it. While I was literally counting down the minutes, adults all around me were complaining about how there wasn’t enough time until Christmas. It wasn’t sheer gift greed that drove my Christmas fever, either. My family was strewn across a few different provinces, so Christmas was one the few times when we actually got together in the same room. To see my dad’s face light up like a kid’s while recounting some ridiculous childhood story with his brother was one of the best things about the holidays, and that’s what I loved the most about this time of year. But this year seems different — rather than anxiously awaiting my most favourite day of the year, I’m cursing each day that passes, as it’s one less day to get everything on my to-do list done. I barely had time to get my little tree up, and with two days to go, I’m not even done my Christmas shopping. I am, as it turns out, an adult. So, with just a few short days to go before Christmas, I’m trying to bring back my Christmas spirit by getting back to what it really means to me — showing the people I love just how much they mean to me. 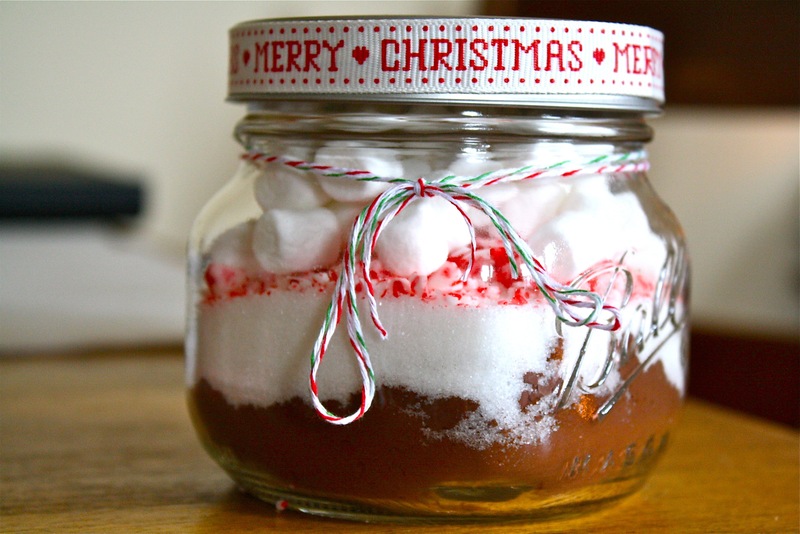 And since my absolute favourite way to do that is through food, these hot chocolate gift jars are the answer. They’re super-quick to make and with a little festive ribbon, they’re absolutely adorable to give out as gifts to your friends and family. This recipe is enough for 1 500-ml jar, so you can multiply this recipe for as many as you need. Each 500-ml jar makes 4 cups of hot chocolate. 1. Wash mason jar and lid thoroughly and let dry. 2. Spoon cocoa powder into jars. 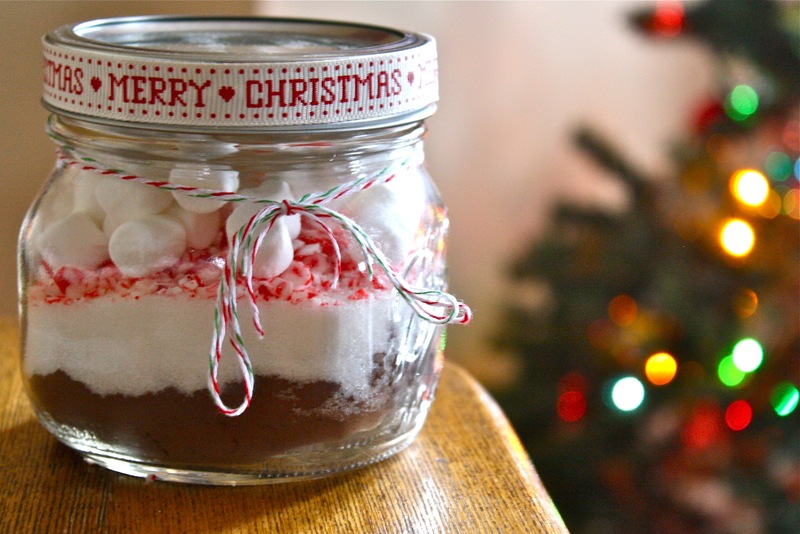 Top with sugar, candy canes and marshmallows. Seal. Include the following directions with each jar, and note that each jar makes 4 servings. 1. Remove marshmallows and set aside. 2. Mix contents of jar thoroughly. 3. Heat 4 cups milk until warm. Stir in contents of jar until completely dissolved. Divide among mugs and top with marshmallows. For adults, you can include the following tip: For a naughty twist, add 4 tbsp creme de menthe to hot chocolate while heating.